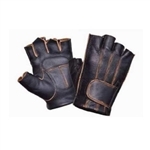 Keep your hands protected in a pair of fingerless motorcycle gloves for men from Leather Bound, choose from premium deerskin or traditional cowhide leather fingerless gloves. Our fingerless riding gloves are perfect for summer or warm weather riding. 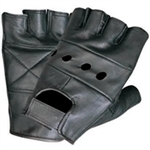 Our biker gloves come in a variety of leathers and mesh, including cowhide leather and soft deerskin leather. You can also choose a mesh style for full air ventilation to keep your hand cool and dry while you ride.